Duravit Happy D.2 is the optimized version of the popular Duravit Happy D bathroom collection. Happy D.2 presents itself in form of a complete bathroom as chic, versatile and timelessly modern as its predecessor programme. The Duravit Happy D.2 wash basin is available with a matching base or a metal console, as vessel sink and as a classic wash basin with standing or half column. 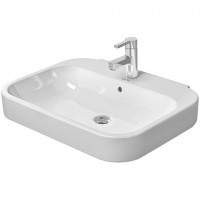 Complentary to your Duravit Happy D.2 wash basin, you can also find Duravit Happy D.2 wall mounted and standing WCs. Optionally, you can get your Duravit Happy D.2 WC in the modern rimless version with and without WonderGliss coating. Duravit Happy D.2 bidets are also available as wall mounted or standing bidet versions.